It is my pleasure to be here today to inaugurate the Global PSE Summit, being organized by the Department of Public Enterprises and the Confederation of Indian Industry. It is an occasion to appreciate the valuable partnership provided by the public sector in India’s development journey. It is also a forum to reiterate our commitment to strengthen the public sector. The public sector has played a stellar role in the Indian economy after Independence. The Constitution of India has guided our approach to public sector. One of the Directive Principles of State Policy says and I quote: "the ownership and control of the material resources of the community are so distributed as best to subserve the common good” (unquote). That the public sector was the core of our development programme was underlined by the Industrial Policy Resolutions of 1948 and 1956. The 1956 policy was unambiguous in assigning a leadership position to the public sector. It stated that "the State will progressively assume a predominant and direct responsibility for setting up new industrial undertakings and for developing transport facilities”. The public sector has acted as the underpinning of our industrial development, operating across critical sectors such as mining, steel, basic and heavy machinery and infrastructure. In an economy that had to be built up virtually from scratch, the public sector became the driving force to bring India into the group of manufacturing nations. An industrial sector that could produce only the simplest of goods was transformed into a manufacturing and infrastructure heavyweight with the capacity to create complex and diversified range of products. The rapid industrial scale-up through the public sector boosted the confidence of Indians. PSEs emerged as major employers, providing livelihood to millions of people. They promoted balanced regional development and contributed to welfare of the communities and societies where they operated. Over the years, several PSEs have emerged as global companies, actively participating in innovative and strategic operations across all geographies. The contribution of our public sector to economic development is indeed seminal. The evolution of the public sector is a reflection of India’s story of economic progress. The public sector started as the chosen instrument to usher in economic development. Economic advancement led to an increasing presence of the private corporate sector, with agile entities running on advanced techno-managerial practices. The government became comfortable in withdrawing from sectors that could be served well by the private sector. At the same time, building social sector assets like rural housing and rural energy called for a re-orientation of the government’s investment portfolio to maintain the fiscal balance. Our economy today is the third largest in the world on purchasing power parity basis. It has the space and the need for co-existence of both the public and the private sectors. Continuity with change has been the defining feature of India’s industrial policy. Though the economic reforms of 1991 sought to restructure PSEs and re-orient their role, the fundamental philosophy of their creation - as instruments for fostering growth and development of the nation - has not wavered. The country needs a strong public sector to complement the efforts of the private industry. It underlines the need to bring in measures to strengthen the PSEs. As vital members of a thriving industry sector, PSEs must drive overall industrial and economic growth. It calls for increased autonomy to enable PSEs to meet the demands of the market in a responsive manner. Managerial and commercial autonomy has been devolved on the profit-making central sector PSEs through the scheme of Maharatnas, Navratnas and Miniratnas. There are seven Maharatnas, fourteen Navratnas and seventy Miniratnas today. These measures, by providing the operational flexibility to respond quickly to market, have led to an improvement in their performance. However, the pressures of liberalization and globalization imply that we cannot rest on our laurels. Much more needs to be done to provide a level playing field between the public and private sectors in terms of flexibility of operation and quicker decision-making. A measure that can help in this process is the listing of PSEs on stock exchanges. Listing will allow millions of small and large shareholders to participate in their ownership, the collective action of which could stimulate the PSEs to better their performance. I am happy that this global summit brings together successful examples of PSEs in other countries. The experience of government-owned companies varies from country to country. While each government has attempted to leverage the resources of their PSEs, the models differ. The public sector model in different nations is a study in contrast. But by studying such models, we can evolve a suitable format that converge the needs of our economy and society. To my mind, the foremost challenge of Indian PSEs today is to increase their competitiveness to deal with market forces. Management has to be of the highest professional level, enabling the attainment of global benchmarks in productivity and efficiency and meeting the multiple objectives expected of contemporary global enterprise. Many of our PSEs have emerged as exemplars in productivity and quality. Their business practices have to be studied and appropriately disseminated to other similar and less successful PSEs. Management of human resources, including dealing with the existing skill gap as well as forecasting and preparing for skills required in the future, have to be accorded priority. As custodians of social development, a high degree of social engagement is expected from our PSEs. Though central sector PSEs are already discharging their duties in the arena of Corporate Social Responsibility, they would need to set an example for their private sector counterparts in view of the provisions laid down in the Companies Act, 2013. Industrial growth calls for high priority in technology development and innovation. Developing new products and processes, entering new markets, and addressing new consumers have to be an ongoing business strategy. PSEs have to take a leading role in espousing such business behaviour. A large corporation has to seek global opportunities to leverage a dynamic and thriving marketplace. Many PSEs have active programmes of overseas engagement. They have to strategize to seize the commanding heights of the global economy. A strong supply chain that links public and private firms has the potential to benefit our industrial sector and economy immensely. Strategies like smooth and facilitative systems for vendor payment, greater use of information technology, and greater engagement of smaller firms have to be adopted to keep industrial operations stable and enable growth of all firms in the value chain. 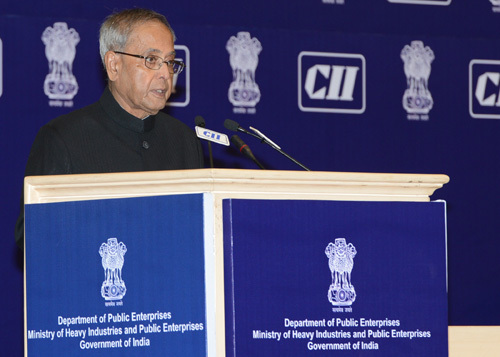 Indian PSEs have been an integral part of the industrial landscape of our country. They have served as progenitors of Indian industry and stabilizers of Indian economy. As model employers and as leaders of the industrial community, PSEs have contributed in many ways. I am confident that it will grow in strength and meet the heightened expectations of the nation. I compliment the Department Public Enterprises and the Confederation of Indian Industry for undertaking this initiative. I wish you all a successful conduct of this Conference.